Over the course of the 48 hour weekend, this NAS sent out over three and a half thousand emails! 3500+ emails! All to our logging email addresses, which then sent it out to the members of the team. 5 team members, 3500+ emails.... 17,500 emails being sent and received. That's a lot email in a short time. Most email servers will handle that and ours certainly did. Fortunately too we use G-Suite (Google Apps new fancy name) and so the volume of mail wasn't an issue. What became an issue though - and this did have an effect on our phones and mobile devices picking up email - was that another network device - a disaster recovery server - also suffered heat stress from failed air conditioning. A sparky had unplugged our monitoring device to charge his tools and hadn't plugged it back in, so we had no idea what was happening (this was Sunday afternoon). When the A/C failed, the server turned off and the replication servers started to complain - four of them, every 30 seconds.... Over 12 hours those servers alerted our logging email address over 5,000 coming in and going back out - another 25,000 emails hitting phones plus the other emails as well. Having had the discussion with clients about hosted email solutions versus onsite solutions, there are definite advantages to having huge servers managing your email. So if you don't have a cloud based solution, how can you mitigate this risk? Defence in depth is a great place to start. Organise to get a mail exchanger - MXGuardDog or something similar. Westnet used to do one too. Get your MX records updated to punch mail through that. These then relay to av-relay.domainname.com. Configure your firewall to only accept emails from the IPs at MXGuardDog (for example) and drop everything else (or at least grey list it so it gets dropped and the sending server can try other MX records). This way you can temporarily control the flow without having your ADSL or NBN connection getting flogged to death. Configure your internal mailer to hold emails for this kind of thing - to recognise a flood of email and trickle it out where possible. The risk is that legitimate email (which these emails both are and aren't) will get lost in the flow. It's better than having your upload link fully saturated though (which will kill all internet connectivity). DoS are bad. DDoS are worse. Let's try to avoid doing it to ourselves! In the course of work and university I've been jumping a bit between Word, Pages and Docs for various reasons. I thought it might be useful to compare them. Let's start. On price Docs is the obvious winner. Free to get access to and solid support on mobile devices. 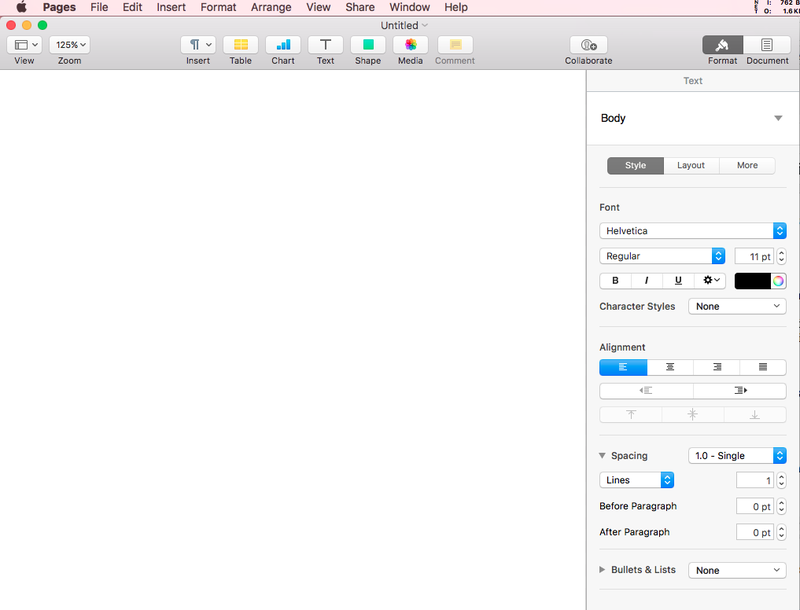 Simple and uncluttered with everything there and looking like every single other word processor through history. Pages has a different take on it, and one that can be a bit confusing to begin with. The sidebar gets added into the mix, and many controls are moved out of the top menu and into here. 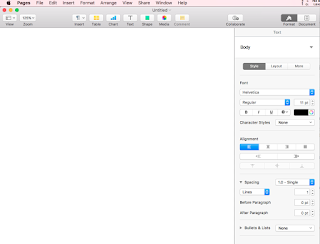 I don't mind this personally, but I do find on the MacBook that I dislike losing the screen real estate to this menu. It is functional though. Since Microsoft changed the menu titles back to being in regular capitals / lower case, the readability of these menus has improved immensely. I remember when the ribbon came out and people loathed it. It just is now and I find it to be quite useful. The drawback for me with Microsoft Word is the sheer number of options available. We are spoiled for choice, control and capabilities and it can be overwhelming at times. The usability winner is a totally individual choice and I leave it up to you to decide. Personally I like Pages but I'm ok getting around all three. This is a big one to consider. Word has clearly got it all (and most users will touch about 10% of it's capabilities day to day). Pages is likewise heavy on features and Docs comes in last, with its smaller range of functions. I think because Docs is web based then it was forced into more simplistic functionality and Google had to really choose the key word processing capabilities to include. There is one function that stands Word out from Pages though in these heavy hitters. The ability to have a section in landscape, while the rest of the document is in portrait is not available in Pages (that I could find). Now most people probably won't care about this overly, but for me, if I'm inserting a large landscape graphic or big table it is critical and stupid Pages won't do it. Very frustrating. I've never really tried it in Docs, but a 3 second Google search shows it's not possible. Word wins for this! All three offerings have Table of Content, header, footer, page numbers, insert stuff blah blah - you get the drift. All the basics and day-to-day stuff is there, and its only the more advanced activities where they are differentiated. Which one is the prettiest? A very subjective question of course. It should be noted that Apple have spent a lot of time on fonts and appearance, but so have Google and Microsoft (they just aren't as talked about). This is up to you - but I rank them Pages, Docs, and Word. Word is a bit busy for me - lots going on and when I'm working on an assignment or report I need clarity. Docs is very good for this, but something about the Pages appearance appeals to me. Pages is Apple centric - don't bother looking for it on anything that doesn't have the Apple logo. That being said, it integrates very well with iCloud and syncs to your mobile device quite happily. Word is starting to become ubiquitous everywhere - Microsoft have released Office365 in a web browser, it's installable and available as an app on most mobile devices. The experience is the same across them all and really is improving. Google Docs is maturing constantly and more features are being added frequently. For collaboration it is King. See updates and writing by other people in almost real time and easily give various levels of access to documents. For working with colleagues Docs is the best - Pages and Word are not in the same realm. While I have been a fan of OTRS for many years and like the interface, reporting and usability of it, I recently chanced across osTicket (from the TV series Mr Robot). It looked interesting and a client I have wants an internal ticket management system (they had also seen it). After a bit of to and fro, they agreed to some research time and I set up osTicket. Have a look at that if you want to install it - it's pretty straightforward. osTicket Task view - got some work to do on NFS No Limits! You can see in the Tickets there is an NFS No Limits ticket. Under the tasks panel, you can see I've broken this down further into the things I need to do with that Ticket. I imagine with multiple agents, the tasks could be spread around. So why not migrate to osTicket? The ability to capture time in osTicket seems to be hideously complicated to implement. Perhaps I need to do more research into that, but in OTRS its pretty straightforward. For a company just interested in getting things done, then the time capture isn't so important, but for us - its a big part of the job being completed. Reporting is still something I need to investigate. The reporting in OTRS is great (once you get your head around it) so I'll be interested to play with osTicket a bit more and see how it goes. Stay tuned for more updates...! 2017 - a new year and new challenges in IT ahead! We're at the 10th day of January and I've already had servers lose their Kerberos connectivity with active directory, our first cryptolocker infection and so much more.... I need a lot more coffee to deal with this pish. Stay tuned - I'm hoping to get my hands on some new tech and describe, some old tech and revive it, and just generally putter around for your amusement. MacBook Pro's (2012) can and do lose their wifi capability - I think the on-board adapter and finding one that works with a Mac can be tricky. Plus all the stuff on fixing Kerberos etc which will be the subject of a post down the track.